The river Severn, the Offa's Dyke Path, the Wales Coastal Path, the Cistercian Way, the Coast to Coast, the Cambrian Way, the Welsh 3000s, the river Conwy, the river Dee, the river Teifi, the river Twyi, the river Usk, the river Wye. Starting on the 2nd of March 2014 I'll walk from my front door up to the Plynlimon mountain, over to the source of the river Severn and then down, along the Severn Way to Bristol in time for an appointment in St Michaels hospital on the 27th. 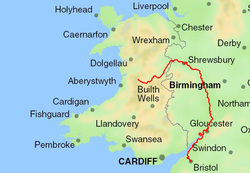 Then it's from Bristol, over the old Severn Bridge and to Chepstow where the Offa's Dyke Path starts, up the Offa's Dyke Path to the top of the Glyndwr's Way, around it then back to the Offa's Dyke Path, up to the top of Wales, on the Coastal Path to Conwy, up the river Conwy, over to the source of the river Dee, and down along it back to the sea again. Passing through - Chepstow, Monmouth, Hay-on-Wye, Kington, Knighton, Welshpool, Machynlleth, Llanidloes, Knighton again, Rhyl, Abergele, Colwyn Bay, Llandudno. 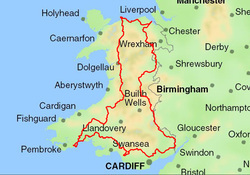 Conwy, Llanrwst, Betws-y-Coed, Bala, Corwen, Llangollen and Chester. 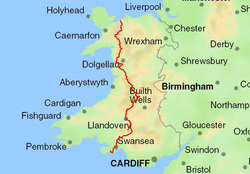 Then, I'll walk along the top of Wales until I come to Rhyl again and this time head down through inland Wales following the Cistercian Way. It's a circular route visiting many ancient sites conntected with the Cistercian monks presence in the country, covering 602 miles through the interior of Wales. Passing through - Queensferry, Rhyl, Abergele, Colwyn Bay, Llandudno, Llanrwst, Betws-y-Coed, Trawsfynydd, Dolgellau, Machynlleth, Tregaron, Lampeter, Tenby, Pendine, St Clears, Carmarthen, Ammanford, Neath, Maesteg, Treorchy, Pontypridd, Cwmbran, Monmouth, Hay-on-Wye, Caersws, Llanfair Caereinion, Welshpool, Llangollen, Ruthin, Denbigh, Holywell, St Asaph, Rhyl. Once I get along the Coastal Path to Conwy, I'll turn left and head South, following the peaks up and down along the Cambrian Way. Passing through - Pontypool, Abergavenny, Crickhowell, Llandovery, Devil's Bridge, Dylife, Commins Coch, Dinas Mawddwy, Llanfihangel-y-Pennant, Bala, then back down to Barmouth and through Snowdonia to Conwy - mostly mountains and wilderness this section - the wildest part of the walk. 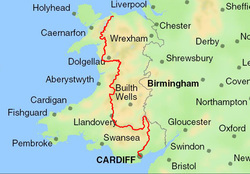 Then back up North again, over the highest peaks of Wales following the Coast to Coast Path down to Swansea. Passing through - Llanfairfechan, through (and over Snowdonia) to Trawsfynydd, Barmouth, Machynlleth, Llandovery, Penmaen. Back at Conwy again I'll continue along the Coastal Path, around Anglesey and down to through Pembrokeshire to Carmarthen where I'll walk up the river Tywi, into the Tywi forest and up to lake Teifi where I can find the source of the river Teifi, follow it down to Cardigan and back onto the Coastal Path again to walk through Pembrokeshire for the second time. Passing through - Abergele, Colwyn Bay, Llandudno, Conwy, Bangor, Menai Bridge, Beaumaris, Benllech, Amlwch, Holyhead, Rhosneigr, Caernarfon, Nefyn, Abersoch, Pwllheli, Criccieth, Porthmadog, Harlech, Barmouth, Tywyn, Machynlleth, Aberystwyth, Aberaeron, New Quay, Cardigan, Fishguard, St David's, Milford Haven, Pembroke Dock, Tenby, Pendine, St Clear's, Carmarthen, Llandeilo, Llangadog, Llandovery, Pontrhydfendigaid, Tregaron, Lampeter, Newcastle Emlyn, round the head of Pembrokeshire again (Cardigan, Fishguard, St David's, Milford Haven, Pembroke Dock, Tenby, Pendine, St Clear's, Carmarthen), Kidwelly, Llanelli, Port Eynon, Swansea, Port Talbot, Porthcawl, Barry, Penarth, Cardiff. Then on to Cardiff where I'll turn left, follow the Taff Trail up inland, through Merthyr Tydfil to the source of the river Taff then over the Brecon Beacons to the Usk reservoir, down alongside the river Usk to Newport then (because I am such a completist) back to Cardiff to turn around and continue with the Coastal Path to the Old Severn Bridge. Over and down to Bristol in time for my second hospital appointment at the end of September 2014. Then, after Bristol, all I have to do is go back over the Severn Bridge, up the river Wye, following the Wye Valley Walk, over the mountain Plynlimon and home. Simple. Passing through - Chepstow, Monmouth, Ross-on-Wye, Hereford, Hay-on-Wye, Builth Wells, Rhayader, Llangurig, Machynlleth. And it leads, in the end, to this wonderfully complicated route map!